Brian Lynch: ANGEL # 9! EVERYBODY'S DEAD # 4! ANGEL # 9! EVERYBODY'S DEAD # 4! Two suh-wheet comics come out tomorrow (or, if you're reading this a bit later, today!). I really hope you guys enjoy it. Love how these came out. Also, the next issue of THE MUMMY book from IDW is out, with art by Mr. Mooney, who of course gave us the wonderful art for the Connor/Kate story in ANGEL:ATF: FIRST NIGHT: ATTACK OF THE CLONES: DEAD MAN'S CHEST. Angel! Spike! Wesley! Monsters! Westerberg! Jack Campbell! Doug! Aurora! Illyria! Pledge Swee! Mosby! Connor! Fred! The Lords of Los Angeles! The Evil Omegas! Tomorrow is a good, good day! is the Illyria cover, cover B? I MUST have that one, it's immaculate. There are so many great books coming out tomorrow. Just check this out. Damn. Looks like tomorrow is going to be filled up. I think I'm going to go with cover A. Pretty much the most badass pic of Angel from ATF yet. Can't wait for both AtF#9 and ED#4! Thanks for the plug, Brian! You are a gent, sir. Cannot wait to get my hands on After The Fall 9 and Everybody's dead 4, two finer books you'll never meet! Both of those are really great looking covers. Can't wait to get my hands on these. AtF is my favorite comic right now. I'm reading Everyone's dead. I almost gave up on it by the end of #2 then I realized I ordered number #3 at the local comic shop. I read it and it was the bomb, yo. Brian, I hope in the end we find out it was just a dream then you call mock us by ending it with the title EVERYONE'S ALIVE! j/k I'm stupid and it's too early for me to actually be typing. loved issue 9. a great return to form! Although, where the hell was Nina? wasn't she in the battle as well? I don't remember seeing her at all. I didn't get After the Fall #8 last week so I picked up both #8 and #9 yesterday and had an Angel double-feature! Great stuff! Although the art in my opinion needs to be improved on. Runge's art on Wesley's First Night story was better. And why did Nina suddenly disappear? ANGEL:AFTER THE FALL # 8 preview! 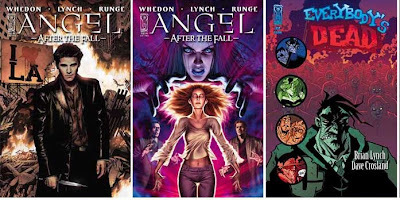 ANGEL:AFTER THE FALL # 8 comes out this week! It's not every day you get to meet a Big Bad.